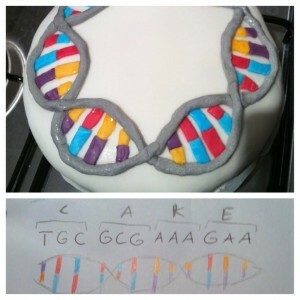 Remember when I made a DNA cake that spelled “CAKE”? Shortly after that did the rounds on the internet, people spotted mistakes. The helix was turned in the wrong direction, and I had failed to stay on the same strand in the twist so the colours were wrong in every other segment. Did it make the cake less fun or delicious? Not really, but I still felt dumb for introducing those errors. I really should know better. I have a PhD in baking — I mean, biochemistry. 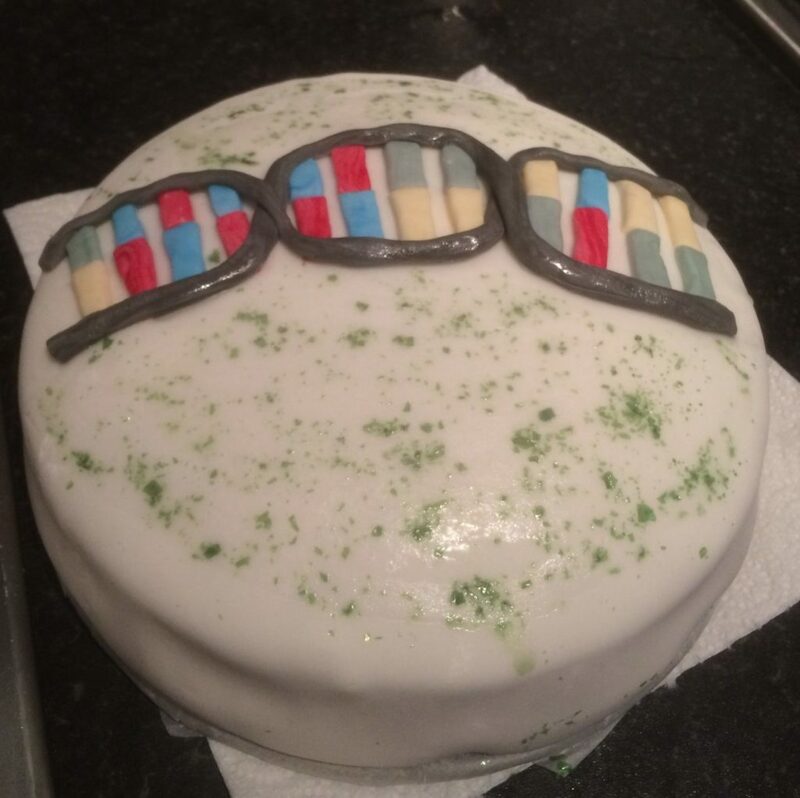 So, when I recently had an opportunity to bake a cake for scientists again, I thought this would be a good moment to redo it, and fix the errors. At work we drew names of the contestants of Great British Bake Off, and the week after “your” contestant left, you’d bring in something you baked. The name I had drawn was Rav, who was known for liking vegan baking, so I thought that’d be a great excuse to also use my favourite vegan cake recipe. When Rav left the show a few weeks ago, it was my turn to bake, so I set aside several hours of my weekend to prepare everything. I finished the final icing details on Sunday morning, and, as planned, made a correct DNA helix this time. The twelve base pairs encode the four amino acids with the one letter codes “C-A-K-E”, the helix turns the correct way, and I followed the strands in the twists. Everything was perfect! Except, a few hours after I finished, I wasn’t feeling very well. I started getting a stomach ache that only got worse and worse. At midnight I ended up going to the hospital to find out what was wrong, and around 2AM I was told I had gastroenteritis. I had to stay home from work until I was all better, and, worst of all, I was not allowed to prepare food for other people! My beautiful cake! Not only could I not go to work myself, but I wouldn’t be allowed to serve the cake to ANYONE! I had to throw it out.